Iranians celebrate Sepandarmazgan in which women, the Earth and life which all have one thing in common – reproduction – are respected and praised. Sepandarmazgan is the day Iranians observe in honor of love, affection and earth, each year. Traditionally it is a day during which the Earth is praised and women are venerated. It is celebrated on the 29th of Bahman in the Persian calendar, which falls on February 18 in the Gregorian calendar. But does it have anything to do with the Western Valentine’s Day? An underlying principle of Zoroastrianism – which is one of the foundations of this land’s [Iran] culture – is the equality of the rights of all humans, including men and women. 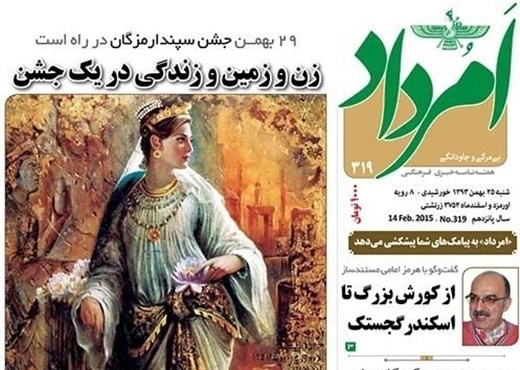 So Bahman 29 [February 18] has been designated as Mozdgiran [Esfandgan], a day to show respect to mothers and women. On this day, men would seat their beloved wives and daughters on the highest place and offer them generous gifts – something which was spiritually invaluable – to show how grateful they are and express their love for the nearest and dearest in their lives. On such an auspicious day, women were relieved of household chores and men would take charge of housework instead to learn more about the importance of the big responsibilities women shoulder in their lives, develop an understanding of women’s status and their position and express thankfulness for what women usually take care of. In the Iranian culture, zan (woman), zamin (earth) and zendegi (life) have one root which means zayandegi (reproduction). Accordingly, [ancient] Iranians used to believe that “woman” is the embodiment of reproduction in the world. They used to call their wives as hamsar (spouse) which – in Farsi – means the one who is equal with her husband, and kadbanoo (housewife or the one who is good at housekeeping) which means the light and manager of the house. In the eyes of Iranians, women – like life and the earth – are of high and lofty value. Recently, certain Iranian theoreticians have tried to call Sepandarmazgan* as the Iranian Day of Love in a bid to prevent people from marking the Valentine’s Day which has nothing in common with the Iranian culture and religion. Although such a move is appropriate and conscientious, it has been pursued out of a lack of knowledge. Iranians should know that the Day of Love for Persians is the day of Mehr in the month of Mehr which is celebrated as “Mehregan” [an Iranian festival celebrated in honor of Mithra, the divinity of covenant, and hence of interpersonal relationships such as friendship, affection and love. The festival falls on the 196th day of the Iranian year or 10th Mehr and 2nd October]. Mehr means love which comes with loyalty to [one’s] promise, and it cannot be confined to Jashne Esfandgan [the Esfandgan Feast is celebrated on Sepandarmaz Day] in which women [and mothers] are honored. Iranians believe that in addition to harboring love for women and life, people should love the whole universe and its single and unique Creator. That’s why love for family members, relatives, coreligionists, fellow countrymen, fellow humans and all symbols of goodness in nature is celebrated on Mehregan which is the Day of Love for Iranians. Sepandarmazgan is a Zoroastrian festival. The date of the festival as observed in the Sassanid era was on the 5th day of the month Spandarmad. When the name of the day and the month of the day were the same, a “name-feast” celebration was always observed.